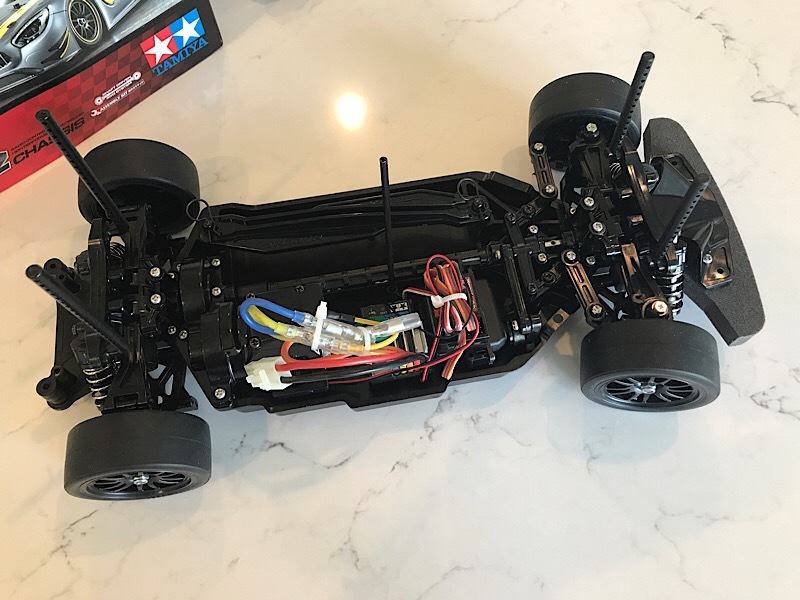 Well Lincpimp's Tamiya M cars got my wheels spinning since the kits are cheap. So I started looking at the different models of Tamiya kits, exploring the different features and bodies. I knew I would want 4WD and shaft driven to start so I ended up zoning in on the TT-02 models. They offer the TT02, TT02D for drift, TT02S, and TT02R with different levels of upgrades and +/- a body. 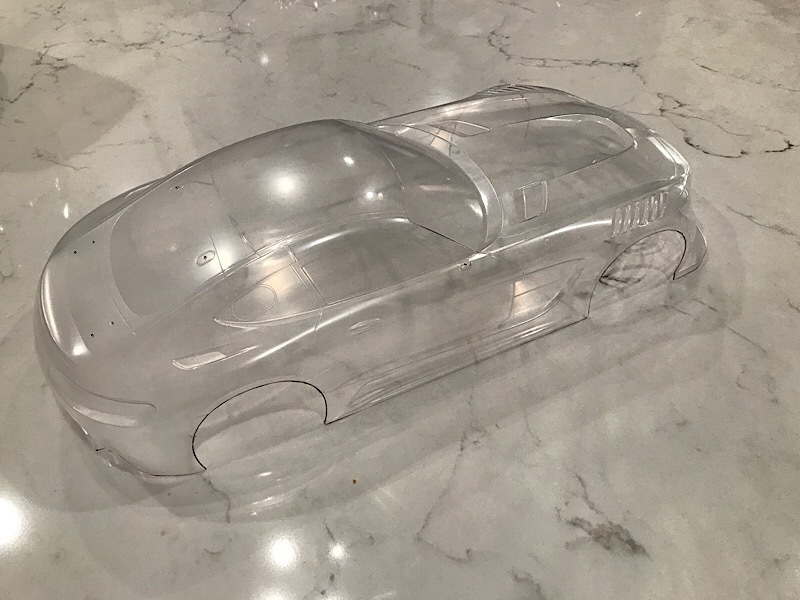 I landed on the base model TT02 with a Mercedes Benz GT3 body. I really like the GT3 lines and looks. Tower got the kit to me in 2 days time and I began to assemble shortly after. The parts trees are pretty well labeled and segmented by area making the parts pretty easy to find when needed. The bags of screws weren't as nicely labeled so it took a minute to sort thru them and make sure I knew which were which as needed by the instruction manual. The instructions themselves are ok at best. They're very cluttered as it incorporates every language on the same page instead of separate instruction sets in different languages. They also list certain parts and screws on the side then put other parts needed in the illustrations. I missed a part or two because of this but its easy to go back and knock it out. In no time, I had the diffs assembled and installed in the chassis tub with a-arms, hubs and motor installed. This was accomplished in roughly 2 hours time with no rush and a 3yr begging to go out in the rain. I did opt for a bearing kit from Fast Eddy's for $15 versus buying the bearings separately. This definitely helped for a smooth drivetrain in the finished product. My plan for now is to run the "Torque Tuned" motor until otherwise needed. I'm trying to keep it tamed for now to help my 3yr son learn to drive. 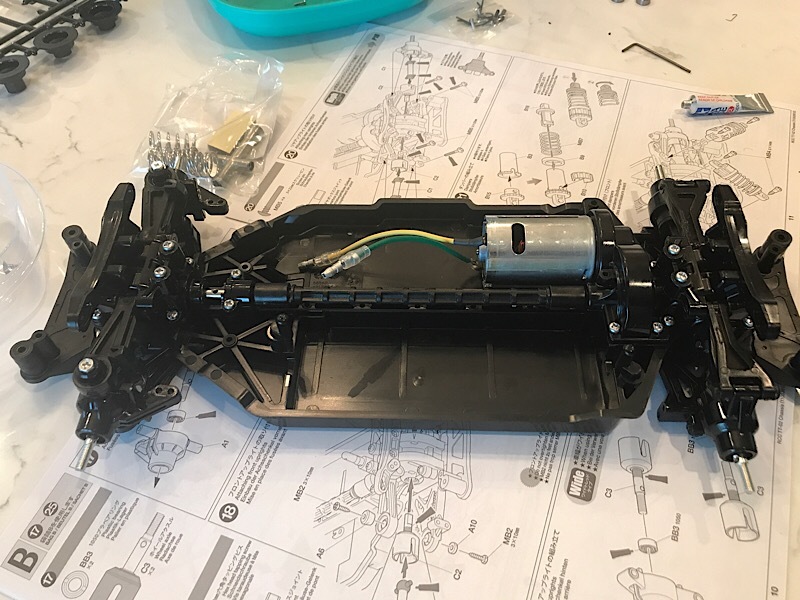 The next morning was installing the shocks, steering components, body mounts and electronics, which didn't take long at all. I soldered on new battery connections and charged up a 2s back and was good to go. Time for a quick test drive. Man it's fun! The ESC/motor combo easily powers this car pretty quickly and can power into a drift nicely even without drift tires. Stock ESC brakes aren't too strong in brushed mode tho. Brushless mode has adjustable brake power and drag brake so I may swap to a 17.5T just for the brake adjustment. The car powers into a drift/donut easily one way but not the other way, thinking that's torque limiting. Stock setup does have some understeer so I'll see if I can fix that to turn in harder. Thinking of a ball diff for the front and maybe locking up the rear diff. For roughly $100, these kits are pretty great. Sensored capable esc, great bodies, easy to assemble. Overall this car is good, cheap fun and I'm looking forward to another. Next up is tackling the body. My boy's favorite color is green so the car will be some variation of green. Not my first choice but hey! Last edited by nitrostarter; 07.10.2017 at 01:08 PM. 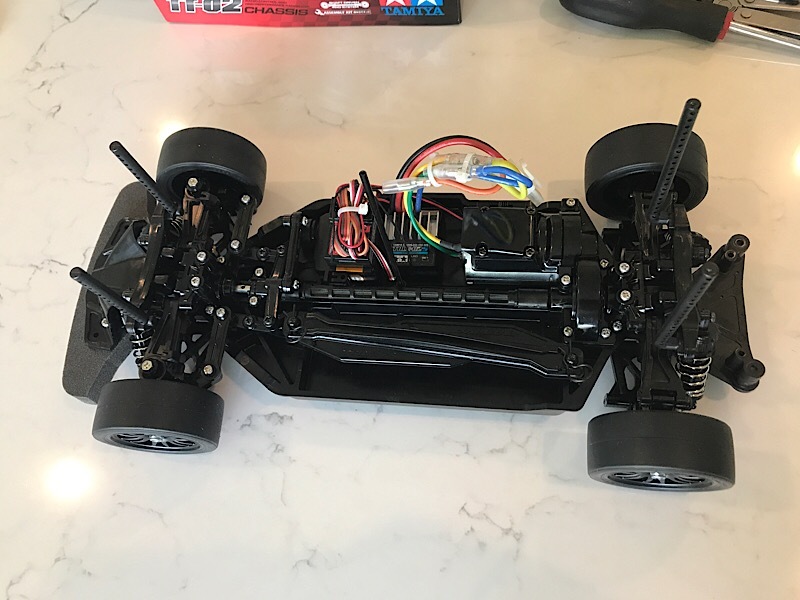 I put an ebay 17.5t bl motor on the same esc that you have. It is about the same speed as the torque tuned motor, so I would suggest a 13.5t if you want to go faster. I have that setup in the tamiya dump truck, but plan to put the 17.5t in the konghead I am working on. These tamiya kits are awesome!!! I am getting a tt02, just need to settle on which one. Probably the NSX. My boy wants to learn to drive so I may pickup the ebay 17.5T to keep it slow enough. This would allow better breaking to be programmed. Although I can adjust the throttle endpoint for him so maybe a 13.5T for when I drive. The detail and lines in the bodies are great. 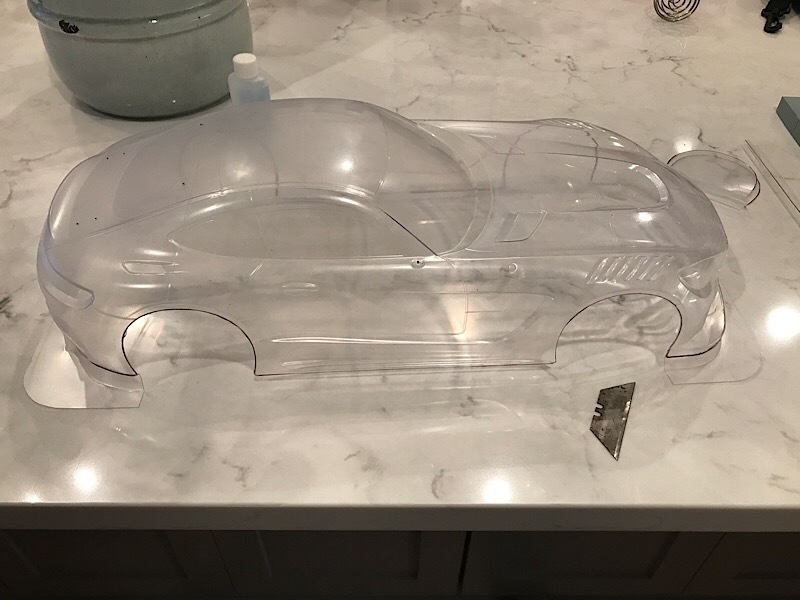 This GT3 body comes with a separate inner nose to make functioning headlight lenses, plastic side mirrors, and a nice rear wing with plastic risers. The NSX looks great too! and for $90 shipped from Tower(with coupon), that's hard to be for what's included. Add a radio and servo and you're running. I put the 13.5t motor on the dump truck, much better than the 17.5t And the brakes are stupid strong on 5 setting, so i dialed it down to 3. The drag brake was factory set on 2, so i went back to 1 which is off. I really think the 13.5t is the best bet for upgrade over the torque tuned motor, which was quite surprising to me. I am using a 5000 50c 2s lipo, so that may be making the best out of the brushed motor! Wouldn't it be an option to get a cheap remote with EPA's on the throttle channel? Then you can use the 13,5 motor, but your son can drive it slowely to. Plus that if he gets more expierenced and wants to go faster you don't have to buy a new motor? I heard good story's about the Flysky GT3B remote, they are cheap as beans. I have both the GT3B and GT3C. Great product and receivers can be had for as low as 5 bucks... I just bought 10 of them of Ebay. The GT3C comes with a lipo battery, so well worth the extra over the 3B. I guess my hesitation is not wanting to tear it up with a more potent motor, thinking the 17.5T would be better. But I'll likely pick up both. I'm thinking about getting some chalk dust and cones to layout a course on my driveway. This thing is a hoot to drive around and the 6100mah 2s I have in there last FOREVER! Get the box of sidewalk chalk, your kid will love it, mine does. She makes roads for me to drive on! That's even better and we already have it. I was just watching the Youstube and saw courses drawn out in parking lots with chalk. Good enough for me. 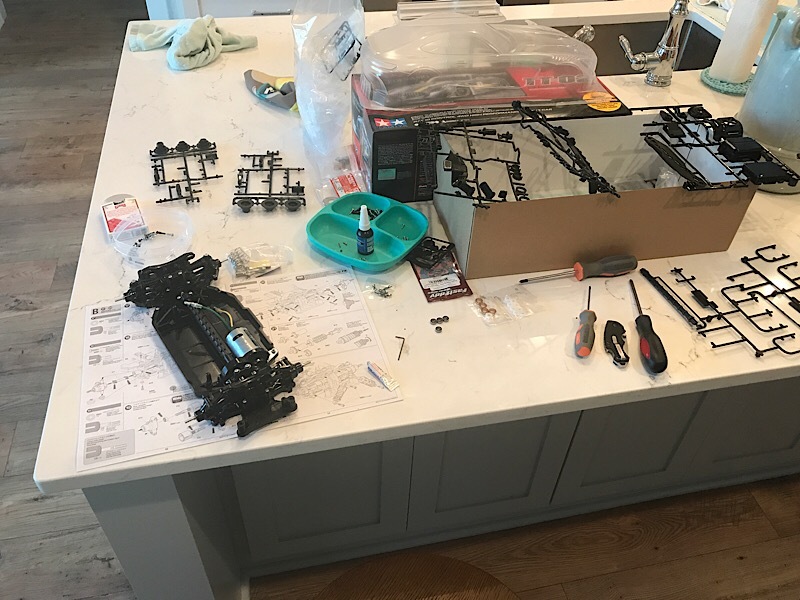 I started work on the FF-3 chassis last night. Killer deal, straight from tamiya usa with free shipping. right at 100 bucks. No esc included, but it does have a bearing kit and oil shocks included. And I should be home alone for a little while this afternoon, I'll try to get the body cut up and masked off. Last edited by nitrostarter; 07.13.2017 at 03:54 PM. Didn't get to th body yesterday but hoping to do that tonight possibly. This is definitely the cleaner method to cutting bodies and getting clean lines and cuts. 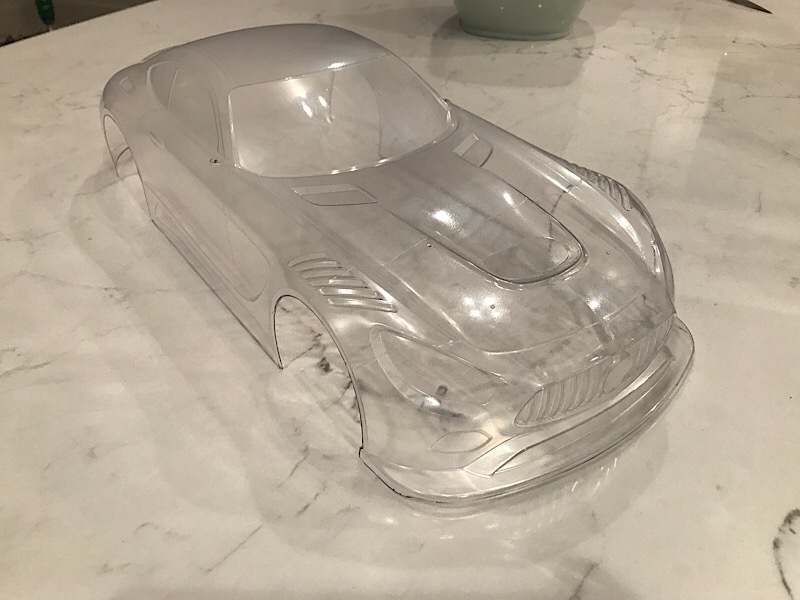 The body lines and detail are great! Man this is a good looking body. 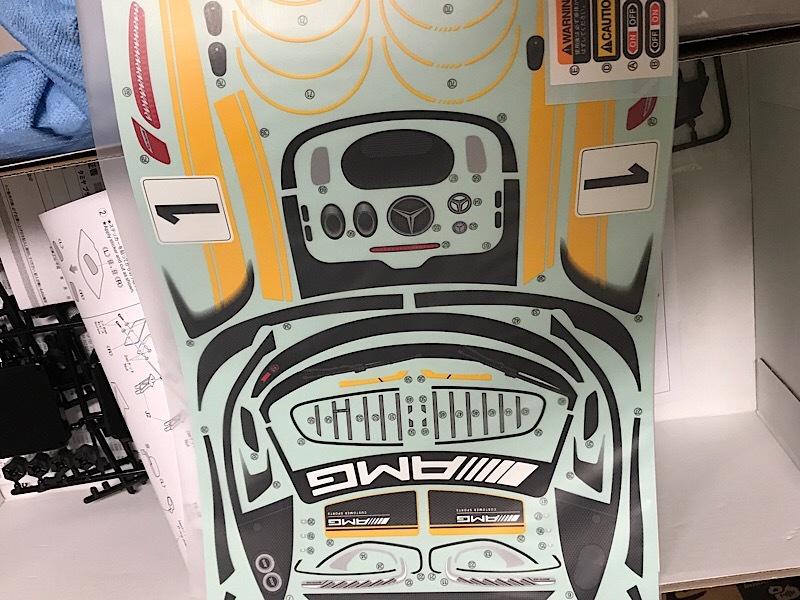 And to top it off, I hadn't looked at the decal sheet. O my! These are great! Again, for $100 these Tamiya kits can't be beat. Looking good dude!! !, and yes, there is alot in the box for 100 bucks.